Truffles are one of my go-to treats for the holidays. They’re a delicious treat that would be considered a bit of a luxury when bought from a chocolate shop. Once you get the hang of the recipe, it’s a lot of fun to create custom flavor and presentation combos to suit the recipient. 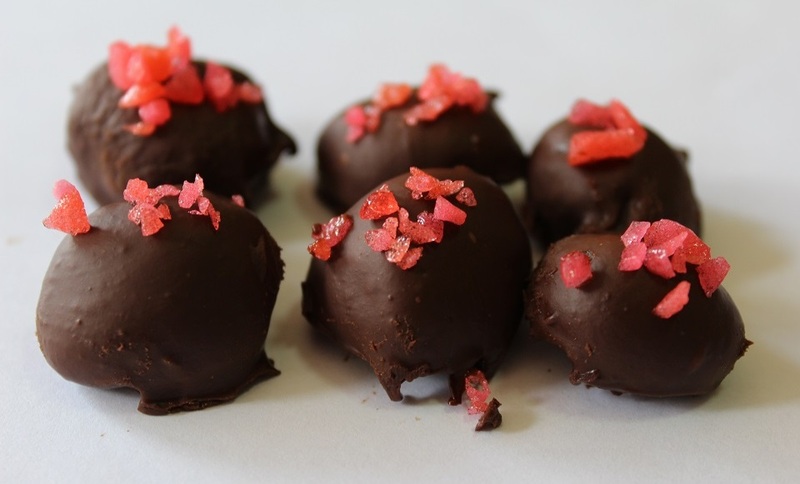 These fireball truffles were created for a Dungeons and Dragons lover. The truffle, named after a popular spell from D&D, has a hint of spice and a bit of a kick from the Pop Rocks. Use them to butter up a new DM or make them for everyone in your adventuring party! In a medium-sized saucepan, mix the cream, cayenne pepper, and cinnamon together over medium-low heat. Heat until it starts simmering. Turn off the stove and start adding 12 oz. of semi-sweet chocolate chips into the mixture. Stir until the chocolate has melted and everything is smooth and mixed together. Pour the mixture onto a wax paper lined pie plate or shallow casserole dish. Place in the fridge to chill for 1+ hours or until firm but scoopable. Remove the plate from the fridge and roll the truffle filling into small balls using a spoon and your hands. Sizing of the balls is up to you, I’d recommend sizing them somewhere between a teaspoon and a tablespoon. Place the balls on a plate covered in wax paper and place back in the fridge for 30 minutes. Pull the truffle balls out of the fridge and dip into the melted chocolate. (Use a fork to fish the truffles out of the chocolate so any excess can go through the tines.) Place the dipped chocolates on a wax paper lined plate or cookie sheet. While the chocolate is still wet, sprinkle red Pop Rocks on the top. Place back into the fridge until you’re ready to serve! Use refrigerated, shaken canned coconut milk as a vegan cream. Also a thicker vegan milk could work like ripple brand pea milk half and half vegan coffee creamers, or a cashew or almond milk. Sub pink salt for pop rocks (which contain dairy).